Another puzzle from Wiseman’s blog (don’t click until you’ve solved it). There are 2 flagpoles that are each 100 foot high. A rope that is 150 feet long is strung between the tops of the flagpoles. 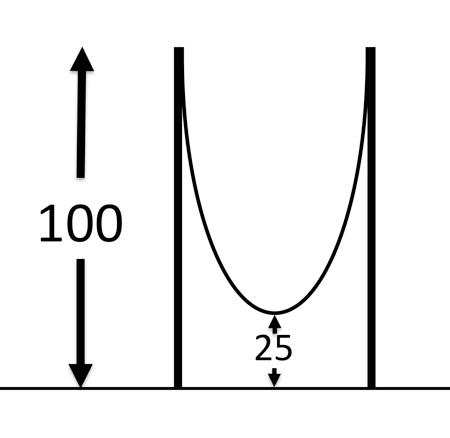 At its lowest point the rope sags 25 feet about the ground (see schematic diagram below). How far apart are the flagpoles? Note: The image below is not to scale. ¡Ja!, ahora sí lo resolví rápido. ¿Digo la respuesta? la cuerda tiene 150 de largo al doblarla por la mitad queda de 75 + 25 son los 100 lo que me lleva a pensar que no existe dicha distancia.